In some small way, all roads have led to this moment, the release of my new 7″ Stay Alone available at jettplasticrecordings.com in conjunction with Shaking Shanghai the label that Matt Goad and I launched. This is the backstory to that song and how I met Haffijy the violin prodigy who was a high school student in Shanghai when we recorded it. When I was Dean of Students in the International Department at Gezhi High School in downtown Shanghai, I told the Chinese teachers whom I shared an office that if any of their students – who were in the public division of the school – had English questions or if any of these same students wanted to talk to a native speaker they could come and talk to me. One student took them up on this offer. He went by the name Haffijy, which I would later learn – to him at least – sounded like a classical composer’s name. Haffijy came by my office nearly every day at noon to ask me English questions. He would ask why we say ‘We will talk over this’ instead of ‘We will talk under this’ and questions like this that would often stump me. I tried my best to explain these nuances in the language sometimes not exactly knowing the reason myself but then thinking for a bit and coming up with an answer that would appease him. When he said – “I know” twice in a row, I knew he understood. At the time I met him, Haffijy was 15 or 16 years old. He was a sophomore in high school and always incredibly polite when he came to see me in the teachers’ office. Our conversations, at that time, never veered from him asking and me answering English questions. That was our relationship – student and teacher. I was considered a Foreign Expert in the Chinese government’s eyes. I had a document that looked like a passport to prove this. “I would like to tell you,” he started and then stopped with a dramatic pause. I had a minute amount of time to think what he might like to tell me. Were we under alien attack? Was the world ending within the next 15 minutes? What did he want to tell me? In a soap opera the poison would have taken affect and he would have keeled over right there. However, this was not Days of Our Lives, General Hospital, All my Children, so Edward was able to finish his sentence. At that point, I had no idea the impact of this statement by Edward. Haffijy was a student who came to see me most days at lunch to ask me English questions. He was bright and polite, tall and lanky with dorky wire framed glasses that his mom probably picked out for him. He carried himself as if he had been 5’6” and then overnight had grown an additional 9” and didn’t know quite how to carry that additional height. All of this added up to a completely endearing young man who was anxious to learn English well. Up until this moment, I thought of him only as my lunchtime English student whom I looked forward to seeing. With that, he was gone. At that time, I didn’t know what to expect. I don’t suppose I expected anything because I had been in Shanghai for two and a half years and I was enjoying my routine. I had advanced from a teacher at a boarding school on the outskirts of Shanghai to running a boarding school in Downtown Shanghai. I lived in a nice flat. I really had a pretty great life in the middle of a major world city. Life was great. How could it get better? This was by no means a life I was itching to leave. So the fact that Haffijy played violin did not carry much impact at the time that Edward told me. At that time, this was just a nice thing to know about a student who I had been helping to learn English. The next day Haffijy showed up at my office at lunchtime carrying a violin case. “I bring violin,” he told me as he took it out of his case. With that, he warmed up and tuned and then he played something that I assume was Paganini – because I would learn later this was his favorite composer to play – but I can’t say that I recall for sure. What I do remember is how he played with such passion and conviction and something indescribable that I have only seen a few times in my lifetime. It was as if he was a conduit from somewhere otherworldly that mere mortals could not understand. I was witnessing un-distilled art. Later when I brought him to America, I would witness the affect his playing had on his audience. Often people would have tears in their eyes after hearing him play. But, at this point, it was just Edward and me listening. I’m sure the shock from the beauty and depth of his performance showed on my face. I do know that Edward and I both clapped when he finished. “Yes. Yes,” he said as he nodded in affirmation. The next day I brought my acoustic guitar and proceeded to play some of my songs for Haffijy. I told him to jump in whenever. Effortlessly, he immediately jumped in. I remember playing Seastones and him soaring on the violin. I had not expected this, us in the garden, him instinctively playing with me like we had played for years. At the time, I knew he was special but I didn’t know how special until I tried to play with other students; the ones who were classically trained like Haffijy could not improvise like him or at all really. He had a gift that could not be defined. The garden at Gezhi High School is certainly like no other high school garden. Gezhi is a few blocks from People’s Square, which is in Shanghai City Center. The garden is on the 4th floor with skyscrapers surrounding it. In one corner, is a large aviary with all sorts of birds and other foul. Amongst the trees, there is that feeling of being in a treehouse or even a space station floating in the sky in the Orient. To be honest at this point in life, I had completely stopped writing songs. As I said earlier, my life in China, though I wasn’t creating art, was fulfilling. Of course looking back on that time, as much as I enjoyed my life there, there was something missing but I did not know this at that time. But then, I had not yet met Haffijy and witnessed his purity of spirit. His purity of spirit reminded me: I am an artist. I was meant to be an artist. I had abandoned my art. But at the same time, perhaps I needed to take a break from creating art. I was happy to teach and then go on outings with my students and watch them as they enjoyed a day in the park or at the zoo or in an ancient river town. I thought I was just ready to sit back and enjoy life as an observer not a participant. I assumed the story of my life had been written and I would observe other lives now. In as much I do suppose as I sat back and observed this world, China and my students refueled my well of ideas – though at the time I did not know this either. So when this magic happened, I was not yet at that point where I wanted to reenter the world as an artist. As I previously stated, I enjoyed my life as Dean of Students. I had worked my way up the ladder in a short time. I had a pretty great life in front of me. Nevertheless that evening when I got home, I started to think about the wonder of Haffijy – his talent, his passion, the magic he embodied. I tried to throw this aside but I couldn’t. It nagged at me like Poe’s Tell Tale Heart, his violin playing in my head like that heart under the floorboards. I had to do something. His talent had to be shared with the world. THIS was my responsibility. I wrote a song – Stay Alone – without much effort. My goal was to write something that Haffijy could put his stamp on, something that would be easily identifiable to him. I tweaked the song for a few days, perfecting it, getting it Haffijy ready and then I presented it to him as a roughly recorded mp3 using Garageband on my Mac with no external microphones. After listening to what I recorded I thought it not to awfully terrible to give to Haffijy to listen to and then to add violin. My initial intention was that I was giving Haffijy a demo of the song and that we would demo the song in the audio-visual room at the school and then later multi-track the song at a high dollar studio. I assumed there was some sort of multi-track capability at the audio-visual room at Gezhi. I was somewhat friendly with the young Chinese computer tech that ran the studio though he didn’t speak English. Any time I had a computer problem, a student went with me to explain the problem. Now, Haffijy went with me to talk to him to ask what sort of equipment was available. We talked in his office amongst the retired motherboards, keyboards and monitors. Or actually, Haffijy and he talked. I listened though I didn’t understand anything. “No such device,” Haffijy told me. So the next afternoon, after school, Haffijy and I met in the audio-visual studio – him with his violin and paper on which he had written the accompanying score, me with my computer. We set forth to make it work. Granted, Haffijy had never recorded before so I had no idea how grueling this would be. Some people are great musicians until the proverbial tape rolls and then they freeze. Would Haffijy be a freezer? I would soon find out. I rolled the tape and said a few apologetic ‘ohs’. Haffijy shuffled the papers making sure they were in the right order and started to play. He had the headphones on so all I heard was sporadic violin. At the end of the first take, I took a short listen. He did not disappoint, and what’s more his magic, though we were not recording on state of the art equipment, came across loud and clear. We did five more overdubs in the time that it took to record them with no mistakes whatsoever. I had found a natural. I knew he was special but this confirmed it in the most awe inspiring way. This was one of the moments when the result was much more than the sum of its parts. Haffijy in his playing completely understood the emotion I was putting forth in the song. This he understood without me saying anything. I gave him complete freedom and he made the song his own. 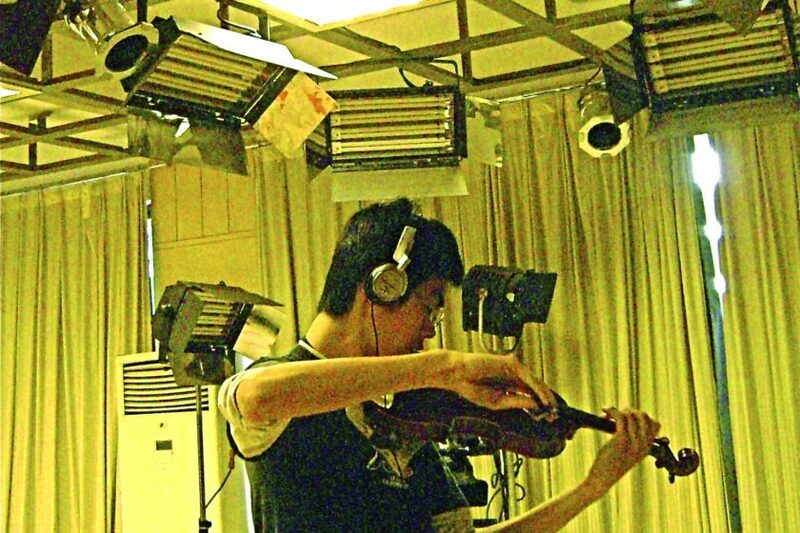 Armed with his six violin tracks and the basic track that I had recorded. I set about doing some overdubs on my own, making sure I did not take away nor overshadow Haffijy. I then meticulously mixed the whole thing and sent it to a few friends. I knew I had something but once I heard back from folk I was way more aware of what I had found in Haffijy. “You are meant to do art! Why are you not doing your art?! You are meant to do art! Why are you not doing your art?! You are meant to do art! Why are you not doing your art? !” It seemed to tell me over and over demanding and questioning and demanding and questioning but I still did not give in. I had the job I loved. I lived in an awesome city. I loved my students and colleagues. I was thrilled that people loved what I recorded but I was pursuing a career outside of art that seemed to be rewarding – actually much more rewarding than most careers. And, I was making a difference in my students’ lives. And, in some small way, I was bridging a relationship between the East and West. At the time, this seemed to be what I was meant to do, bring people together. Furthermore, I then decided to go off to the Middle East to teach because I thought it important to see for myself how the Arabs, Persians and the Turks felt about the West. I landed a job in Jeddah in Saudi Arabia. (More about this at another time.) Not to get off topic, but everyone I met was very friendly, beyond friendly even. Everyone in Saudi wanted to host me in their home. They wanted to see America. That experience was an awesome one but there were some problems at the school I was placed. There are always the few who want to ruin it for everyone. I had to leave Saudi in the cover of night. That is when I realized that I must live as an artist. Funny how the threat of death wakes you and you become aware of who you are. I am now totally aware of who I am. In as much, Haffijy and I have become musical partners. Sometimes I record in China with him on board. Other times, I fly him to America to play shows with me. Haffijy has become an integral part of who I am as an artist. Stay Alone – my new single – as I said before, is the first song that Haffijy and I recorded. I wanted to wait to put it out until the right opportunity came along. Jarrett Koral and his wonderful label Jett Plasitic Recordings is absolutely that right opportunity in association with Shaking Shanghai (my label which I run with Matt Goad). Thank you Jarrett for presenting this song to the people. Although the song is called Stay Alone, at the end of the day, we all need each other. And we should always remember there is a lot of love in this world.